I wrote these between 2003-2006 during the height of madness around the Iraq war and lingering fallout from the elections of 2000, 2004, 9/11 and the decline of the press and the rise of the ultra-right manipulation machine. I was alarmed by the shift in meanings and actions, a perversion of language and words— the reversals of meaning. By the time the issue was finally finished in fall 2008 (especially after the november 08 election) I was concerned that the whole issue was out-dated. I foolishly believed Obama’s election would lessen the bitter partisan downward spiral… but it has only radicalized it. Now you have people on Fox opening calling Obama a racist and a Nazi. Seriously, what kind of logic is this anchored in? What exactly do these people think Obama has DONE? Try to create national health care? People blather on about “death panels” and what they are apparently too stupid to see is that the corporations are ALREADY everything that they accuse Obama of trying to create! The election of Obama has the Right foaming at the mouth… no lessons learned, just blame and lies. And on the precipice of genuine derangement. Hypocrisy IS the new Morality. And it is a warning. The right is accusing Obama of being a socialist (humorously, in the Stalinist mold) and a fascist… this was a tactic of the Germany Nazi’s- accuse your enemy of what you yourself are doing. But what really constitutes fascism? (often disguised as a rejection of capitalism). Which dictates that action is of value in itself, and should be taken without intellectual reflection. This, says Eco, is connected with anti-intellectualism and irrationalism, and often manifests in attacks on modern culture and science. Fascism devalues intellectual discourse and critical reasoning as barriers to action. form of racism or an appeal against foreigners and immigrants. Fearing economic pressure from the demands and aspirations of lower social groups. And the hyping-up of an enemy threat. This often involves an appeal to xenophobia or the identification of an internal security threat. There must always be an enemy to fight. Although a fascist society is elitist, everybody in the society is educated to become a hero. Fascism employs and promotes an impoverished vocabulary in order to limit critical reasoning. How much of this sounds familiar to recent events? All too much if you ask me! “The liberty of a democracy is not safe if the people tolerate the growth of private power to the point where it becomes stronger than the democratic state itself. “In manipulating information, we see a departure from classic fascism. Then it was ceaseless propaganda backed by spies and informers, to bind elite support and to mobilize masses—often using the new technology of radio. The friendly way is with monitoring (using opinion polls and focus groups) and ad hoc communications aimed at passive acquiescence. Faceless oligarchs manage the minds of elites via learned journals, the business press, and educational programs. They mystify and immobilize the masses via the hypnotic use of electronic media, mainly television. “The East collapsed because it blindly believed Western utopian ideas of freedom of the individual. The West, on the other hand, survived because through its corporate logic it discreetly introduced a system of unconscious collective non-freedom. but if the conservatives could have their Holy immigrant free-artless-white bread-Bible state somewhere… with no taxes, guns for everyone, whatever… at least the rest of the country could move forward. I can imagine that progressive America unchained by fringe conservative lunacy could actually be a better place. A place where you could afford to go to the doctor, where you could buy a car that wasn’t built to become obsolete within two years, a place that wasn’t under the spell of corporate cannibals, where education was free and creativity rewarded. A place where everything didn’t have to be a instant commodity. It just all feels SO irreconcilable. The arc of modern civilization, for all it’s achievements, has been distorted into the practice of making nothing out of something. The rich and powerful control almost everything, including us by proxy. The world and everything in it has been mapped in some form. There are no unknown mysterious places on the map anymore. we live in a world dominated by knowns, limits and boundries. All owned by someone [else]. Do not step on the grass. also by corporate marketing of “cool” and their virtual monopoly on resources. 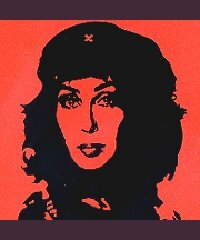 What space is left for art, for true individuality in a world of total commodity and the pathological pursuit of profit? Unless that art or individualism itself fits into the revenue stream, nothing. The concept of temporary autonomous zone. One of the primary themes became the map itself— looking beyond the obvious, realigning with aspects of the magical, the imagination, with our inherent power as creative individuals, beyond out capacity as consumers and beyond our credit limits. There is no (or extremely little) legal public space for art or the voice of the individual. 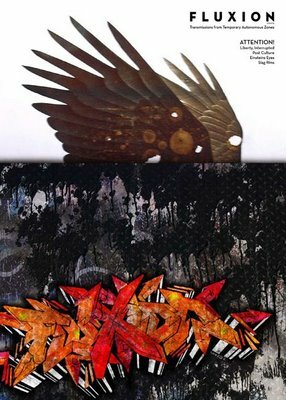 These symbols reoccur in various forms. Scenes from Burning Man are another visual used to tie into the idea of the TAZ. The concept of TAZ was first put into practice on a large scale by the Cacophony Society in what they called Trips to the Zone, or Zone Trips. One of their Zone Trips gave birth to Black Rock City, also called the Burning Man Festival. Smart mobs and flash mobs are also examples of the concept of TAZ put into practice, if only very briefly. It comes down to issues of control. Political, economic, reproductive, sexual, and psychic. The nature of the unorganized, underground, private, or short term public TAZ defies these controls. 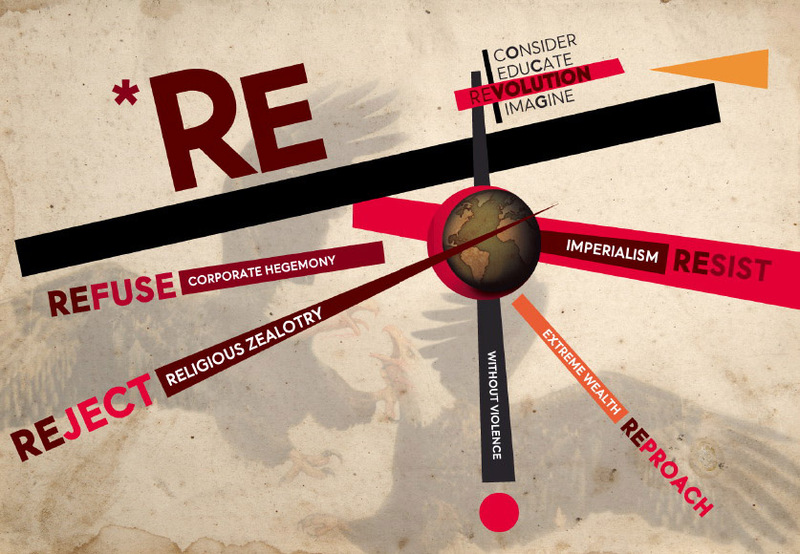 As Bey points out— like the map, revolution is closed, but insurgency is open. William S. Burroughs wrote extensively on the forces of conformity that would destroy the unique qualities of the individual in his novels, such as Naked Lunch, The Ticket that exploded, The Soft Machine,The Nova Express, Cities of the Red Night, and the Western Lands. The TAZ offers a potential disruption of the routine. Even a little break from routine is exhilarating. To survive, to evolve, we must disrupt the routine whenever possible, even if we can’t break free from it. In little ways over time we can alter this trend. The scale of participation is the key to how far reaching the effects will be. I used to dream of breaking free (in the traditional sense) but that no longer seems realistic. I’m hopelessly in debt, my pay is attached directly to hours worked, and I have no other equity or resources. I still aspire to economic independence (the the creative independence that comes with it), but remained tethered to obligations like paying the rent and food, not to mention paying down debt from past attempts to break free, for the foreseeable future. in civil conversation when ever possible…. These are little everyday little soul saving endeavors, mirco TAZs, like oxygen in a fish tank. and through them anything is possible…. It is time for us to get off the grid altogether…. One of the most important things any of us can do as a citizen is to speak out. In order to be effective though we must seriously educate ourselves. When I began researching Fluxion, issue 4, I realized I was going to have to take some time and do some extensive reading. Actually this began a few years ago. My friend Marc Borzelleca’s father was visiting and we all had gone to dinner. Conversation eventually steered to political subjects. I made a comment about some issue… the Palestinian conflict I think… and while I knew he agreed with me, he challenged me to explain my view. I was stunned— mostly because I could not defend my opininion in conversation with him. He wanted to make a point about knowing your subject, really knowing it—from all angles if you plan to discuss it with any knowledge and depth. It was a watershed moment. I was so inspired. It is an ongoing challenge too. I try to encourage others whenever possible to do the same. Ignorance and resentment are quick paths to violence and hatred. Education and openness can counter this. Willingness is the key. Instead of trying to change someone’s mind on any isuse ask them the origin of their views. In the course my own reading I have come across numerous texts that I think are essential reading, and others that have simply been very informative. I list many here (by catagory) as a starting point. 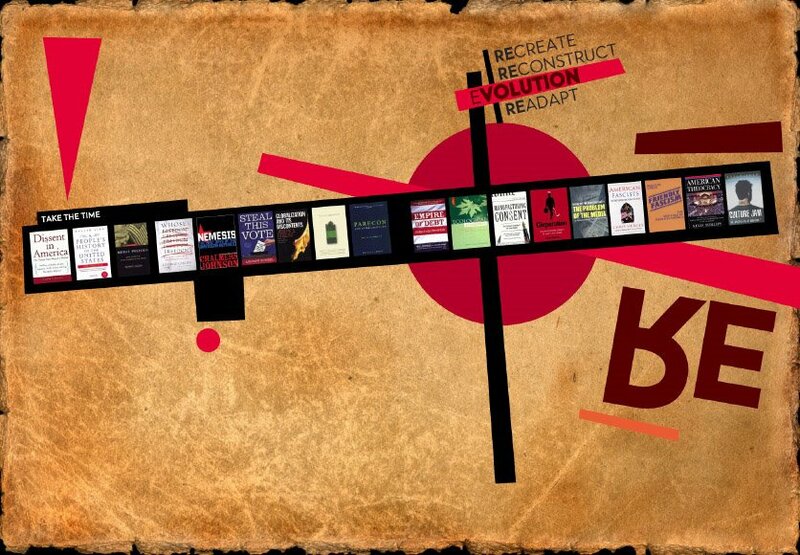 Visit your local (preferably independent) bookstore and see what looks interesting and informative to your concerns. Extremism is one of the biggests threats we face as a nation. We hear all the time about foreign terrorists, but its the domestic ones we really need to take a close look at. Nemesis: The Last Days of the American Republic. Empire of Debt! Man, has this one come home to roost! Even with Obama in the White House, I think it’s unlikely the economic polices of the US will dramatically change anytime soon, but bold changes are needed. These texts offer many great ideas, and opportunities for interesting conversation on how any change can effectively be made. alistic turning away from all forms of herd mentality. Culture jamming sometimes entails transforming mass media to produce ironic or satirical commentary about itself, using the original medium’s communication method. Sound menacing right? It’s supposed to. I believe that every time we chose to be complicit with forces that ultimately work against our interests we, if metaphorically, are embracing evil. This piece was the first cornerstone in the issue. 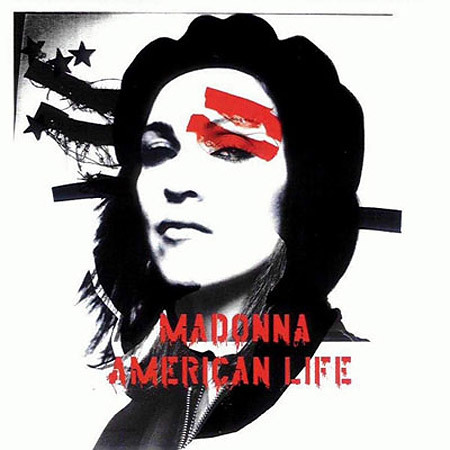 It was conceived in 2003 on the eve of the Iraq war. I had attended a lecture at UCLA where Gore Vidal spoke on the impending invasion. One of the things he said made a deep impression on me. He quoted Benjamin Franklin from his comments on the new Constitution at the first Constitutional Convention in Sept 1787, where he said…. Vidal’s phrasing was simplified to something like “Benjamin Franklin himself said that the American Constitution could only end in Despotism.” or at least that’s how I remember it. This was a crystallizing moment. This comment, made some 216 years previous, described exactly what I felt was my experience of the government. Coming from one of the most innovative and brilliant founding fathers only gave it more gravitas. The cultural and political focus of the issue is built entirely around exploring this observation. On a daily basis I was feeling demoralized by the blindness of the media, the slanted reporting (aside from Fox altogether), and the general apathy on the part of people go along with whatever was being said as long as it was in Time, or CNN or similar news outlet. On every level I saw complicity, apathy, and unwillingness to act. I was furious at myself. I attended several protests against the war, which proved to me that street protests have little to no effect anymore. I felt lost. I felt uneducated on the particulars of many of the political issues (though since 9/11 this had changed) I wanted to speak to all that. I was working long, long hours for a low wage and was just too tired to much to do more than simply get my work done and keep basic bills paid. Your average wage slave. The partisan rankling was and continues to be a disgrace. I was outraged that what passed as Civil dialogue were little more than shouting matches. Disagreement became treason. To me this was a new fascism being born. I tried to task myself to make different decisions. Try not supporting any corporate products. You can’t buy hardly anything. Local food and products are more expensive. In every way it was difficult. This is how they win. We are lulled to our own destruction by convenience. 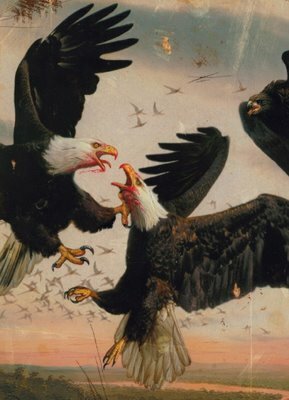 I had an recurring image in my mind of two eagles ripping one another apart in mid air. I knew this was the image I wanted to illustrate this sentiment. I researched illustrators and decided on Chang Park in Chicago. He rendered my idea better than I could possibly have imagined. I kept writing and editing the draft of my essay on my concerns, and delays kept postponing the issue. Time passed… other projects and work made it necessary to push Fluxion aside. In light of the evolving situation, the piece was in a constant form of revision. It wasn’t long before I started seeing others espousing the same ideas and concerns, often better argued and more articulately. by 2006 I was entirely deflated. Fluxion was hopelessly staled with no resolution in sight, and I felt like what I had to say was entirely redundant. I abandoned the piece to focus on other featured artists in the issue. 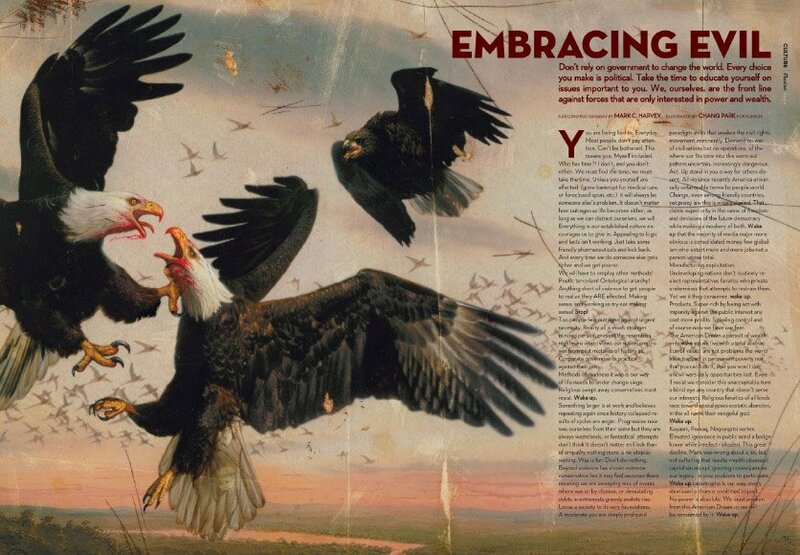 By the time I finally revisited “Embracing Evil” in late 2007 I had had several breakthroughs. So much had been written in the mainstream and alternative media, that anything I had hoped to add was already out there. I read as much as I could and tried to find a perspective that I felt was unique, or at least a way to presenting it. I knew folks were getting burned out, I knew I was. Wave after wave of scandal and tales of abuse of power kept coming. It was overwhelming. I had decided early on to include numerous “visual essays” where a single idea, quote or comment was accompanied by a striking visual interpretation. By 2007 I knew I would need to apply that approach to more and more segments of the culture section of the issue. ter everything else was done though, I still had my little essay that I didn’t want to entirely throw away. Ultimately I kept the subhead, the first and last paragraphs as linear thoughts, and took the rest and did a cut-up. I had long been intrigued by the cut-up method developed by Brion Gysin and employed to greatest effect by William S. Burroughs. I reordered the text of the original “Embracing Evil” essay with a poetic eye and punctuated it with the occasional phrase “wake up” in bold. I figured most people wouldn’t bother to read hardly any of the text anyway, but would be more likely graze the content, as people seem to do more and more these days. 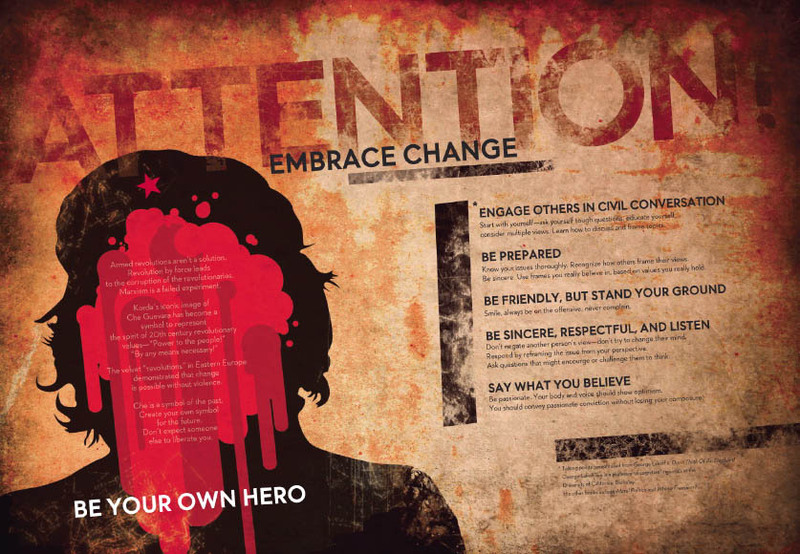 The task was to create visuals that still communicated the core ideas. When In New York in August 2006 I saw the DADA retrospective at MOMA. DADA seemed like the perfect filter though which to approach the ideas in the issue. I extended the reference also to include early Modernist Graphic Design principles, forwarded by artists like John Heartfield, Kazimir Malevich, and Jan Tschichold, which all seemed well suited to our current situation. While the election of Barack Obama has heartened many with the possibilities of serious change, enormous work remains to be done. If substanative change is to be successful, then we must all share in the responsibility to create it. 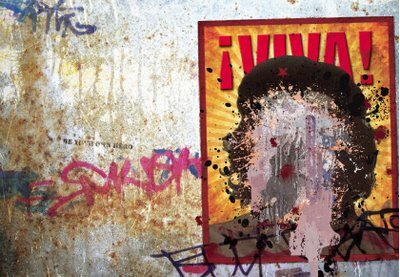 The idea for this image follows a long line of inspiration whose ultimate source is Albert Korda’s Iconic Photograph of Che Guevara. My adaptation of Korda’s famous image came about specifically while working on ideas for a one-sheet for the documentary Chevolution when I was a designer with Kustom Creative. It didn’t take long for me to go down a rabbit hole in searching for ideas. I was so excited to be challenged to utilize one of the most famous images of the 20th Century! But I kept hitting a blank wall, or more accurately, a blank face. After much thought and reflection I realized the image just didn’t mean anything to me anymore. I have revered it for years, and yet it never really questioned why. 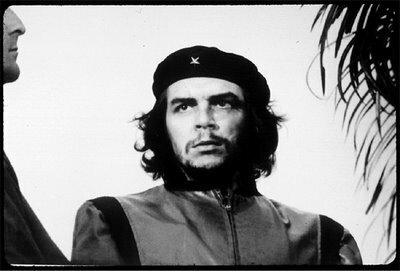 It was all magically based on Che’s expression—so intense, so magnetic, and all too simple. Dangerously simple. It took me years to look beyond the parroted myth of Che, so find a more complex and confilcted man, though no less interesting. There is a huge difference though between the man and the icon that has come to represent him and his ideals. 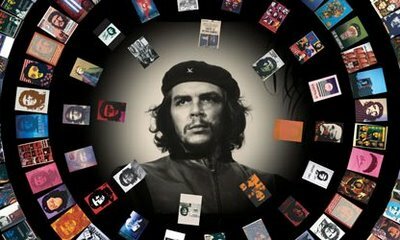 There is an interesting book that charts the course of Korda’s Che titled: Che Guevara: Revolutionary and Icon by Trisha Ziff who also directed Chevolution. 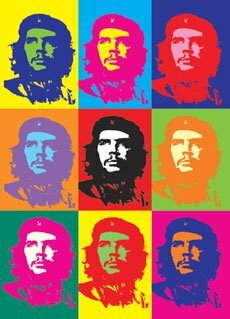 It is common knowledge that the image has been adapted and abused so much in pop culture that in my mind any significance Che’s image may have had was long co-opted or perhaps lost altogether. When I look at the image now in my imagination I just see a blank face, or one smeared out or painted over. It’s impossible to discuss Che and not Not to mention the sad arc of Marxist Socialism in practice during the 20th Century. The enduring legacy of armed leftist radicalism is corpses. While I think Marx was correct on numerous observations, particularly Capitalism, his vision overshadowed one critical detail. Human nature. Che failure is directly linked to this complexity. Even given a choice some people will choose to exploit or manipulate or be self-serving. Soviet Russia was a dark experiment on a large enough scale to prove that. In Cuba the system also proves unsuccessful, doomed to the flaws of human nature and the idea that one ideal must dominate over all overs, at the expense of individual freedom, not to mention economic and political. I knew right away that my idea had no traction for the documentary project, but personally it promised to be an interesting experiment. I decided to just do a adaptation for my own self published art and culture zine Fluxion. The first version was a literal interpretation of my original idea, where Che’s face was simple painted over. From there I decided to do a more simplified, stylized version (see above). I adapted that version into a sticker. I have heard that some people thinking the red on the face in the stylized version indicates blood. That was not my intention. I envisioned paint to obscure the face. Red was just the most striking color to use. The image is NOT intended to disrespect Che, or dismiss him as a person of importance. 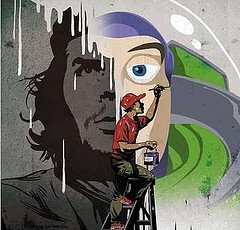 My adaptation isn’t really about Che at all. I do not share his belief in violent struggle. I am sick of violence. My image adaptation is about the commodification of the representative image in culture. We look outside ourselves for ideas, for inspiration, for leadership. I wanted to create something that reversed that, to put the responsibility back on the viewer. I believe we should question our own actions and choices more critically. 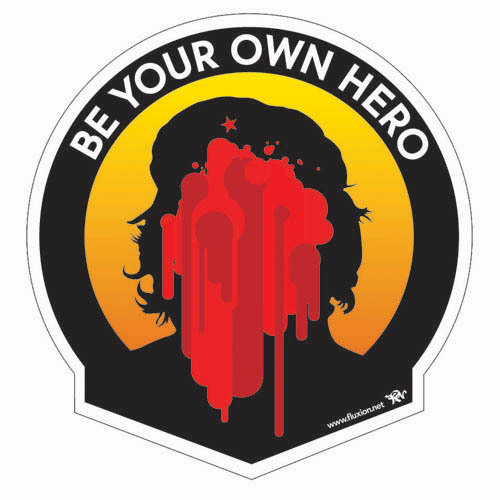 We must become our own heroes. 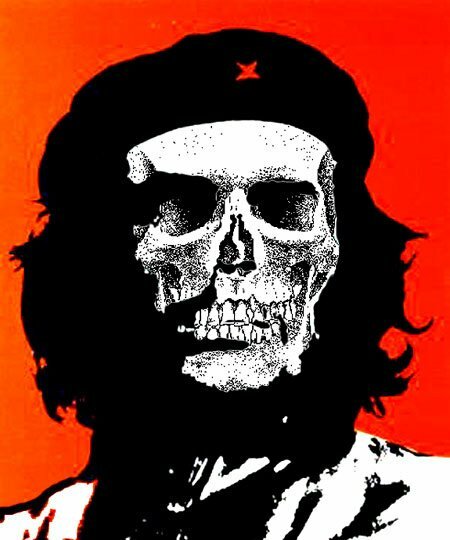 Alberto Korda’s Iconic portrait of Che Guevara has been the most recognized symbol for social struggle in the 20th century. 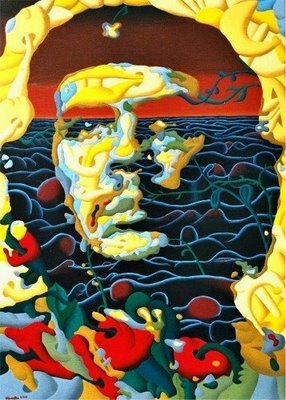 Che, the man, was a fascinating force of energy, and contradictions…. “As a young medical student, Guevara traveled throughout Latin America and was transformed by the endemic poverty he witnessed. His experiences and observations during these trips led him to conclude that the region’s ingrained economic inequalities were an intrinsic result of monopoly capitalism, neocolonialism, and imperialism, with the only remedy being world revolution. This belief prompted his involvement in Guatemala’s social reforms under President Jacobo Arbenz Guzmán, whose eventual CIA-assisted overthrow solidified Guevara’s radical ideology. Later, in Mexico, he met Fidel Castro and joined his 26th of July Movement. In December 1956, he was among the revolutionaries who invaded Cuba under Castro’s leadership with the intention of overthrowing U.S.-backed Cuban dictator Fulgencio Batista. Guevara soon rose to prominence among the insurgents, was promoted to Comandante, and played a pivotal role in the successful two year guerrilla campaign that deposed Batista. Guevara remains a controversial and significant historical figure. He was a ruthless disciplinarian who unhesitatingly shot defectors. Following the Cuban revolution, Guevara reviewed the appeals of those convicted as war criminals during the revolutionary tribunals, ratifying sentences which in some cases utilized firing squads. As a result of his perceived martyrdom, poetic invocations for class struggle, and desire to create the consciousness of a “new man” driven by “moral” rather than “material” incentives; Guevara evolved into a quintessential icon of leftist-inspired movements. Here is an interesting interview with Jorge Castañeda author of the Che Biography Compañeo. His image, primarily Korda’s famous image of him, has been co-opted so many times that by the end of the 20th century it has been rendered essentially meaningless pop fodder. The radical leftist movement is a relic of the 20th century. It’s methods corrupted it’s potential to live up to it’s ideals. me adaptations are outright insulting. And in the end it means nothing. Che said “I don’t care if I fall as long as someone else picks up my gun and keeps on shooting.” and plenty did. And in their wake is nothing but death and ruins. I was heartened by the velvet revolutions in Eastern Europe in the late 80s. They prove change is possible without violence. I agree with this wholeheartedly. This was the source of inspiration for my adaptation of the image, which is, in my mind, in the spirit of his original idealism, adapted for our times with a strong memory for violent missteps by armed movements in recent history. Che is corrent when he says it is our responsibility to liberate ourselves… and I would add an emphasis on practical ideas, courage, good works and compassion, not violence. Since I got back to town I have been trying very hard to iron out the last unresolved details in the production of my vastly overdue fourth issue of Fluxion. Just a few minor details and hopefully within a week or two at the most the new issue along with all the previous issues will be posted as flippingbooks- entirely readable, zoomable too. Next time I will start an ongoing series highlighting content in the issue.